I feel fortunate to have been invited by some of Austin’s best and brightest to speak about my experiences and perspective on design. I always enjoy meeting creative folks and sharing my passion so please contact me if you’re interested in having me speak to your group. Thinking Design: on trusting your gut, and other lost arts. Presented to Frog Austin, August 2017. User journeys. Focus groups. Prototyping. Validation. Research. Research. Research. And oh, the glorious data. These practices dominate the process of nearly all modern digital experience projects. The Golden Age of XD is upon us and branded methodologies like Design Thinking are celebrated by both agencies and clients alike. So where does the visual designer fit within this new world order of users, research and validation? What is our role throughout the process and how do we best leverage our unique talents? Presented to IBM Design for IBM Craft Con 2016. 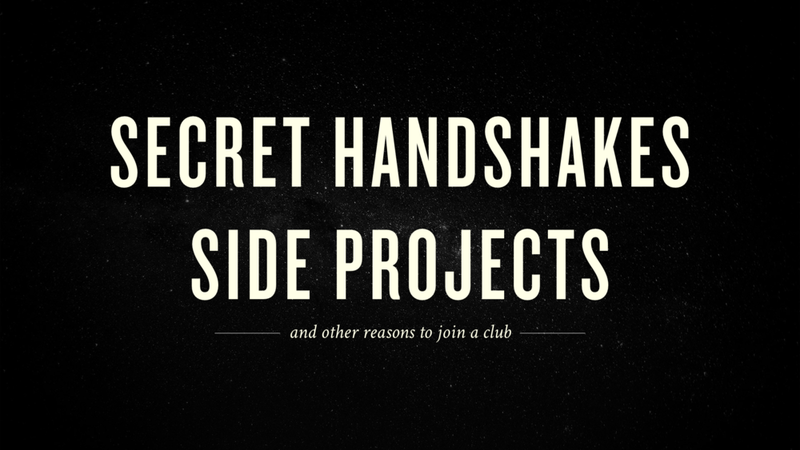 A top-secret club my sister and I started when I was 8; a very short stint as a Boy Scout; an opportunistic project for the Dallas Society of Visual Communications. Throughout my life and career, I’ve been involved with countless organizations, groups and societies, both big and small. These leagues of like-minded people offer a sense of belonging, brutally honest feedback and at times, provide opportunities to create more personal and meaningful design. While working at BBDK, a small studio in Santa Fe, New Mexico, I was lucky to connect with a group of creatives who had a profound and lasting affect on who I am as a designer today. My experience with them provided the inspiration and helpful nudge I needed to create one of my most successful personal projects to date, Design Facts.